Made from western red cedar construction and assembled with stainless steel and dichromate plated screws, washers, hooks and chains. All Stovall products are hand-sanded and crafted with pride in Michigan. 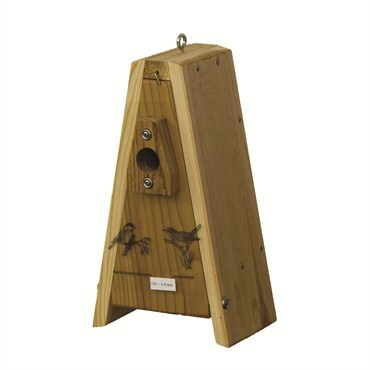 The Country Squire A-Frame wren house has a built-in predator guard and 1 1/8-inch entrance. House has sawed grooves in wood below entrance for young birds learning to exit.